Get Dressed for Battle has increased the size of the dome on this Spiral Fluted Buckler - 14 Inch, so it will fit even the largest of armored gloves. The unique design adds interest as well as structural integrity to the steel. In addition, these new bucklers have a more historical straight handle. Crafted in 14 gauge steel, all of the GDFB bucklers have rolled edges and riveted steel handles for years of hard use in the field. They have gained a well deserved reputation as being some of the toughest on the market for reenactment and combat use, and are appropriate for kits from the 12th to the 18th centuries. 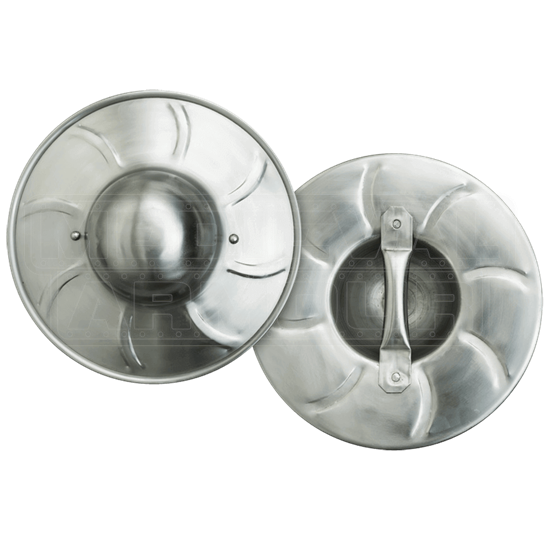 The Spiral Fluted Buckler - 14 Inch has a sleek design that will serve you well for SCA, LARP, 1.33, or other combat scenarios.